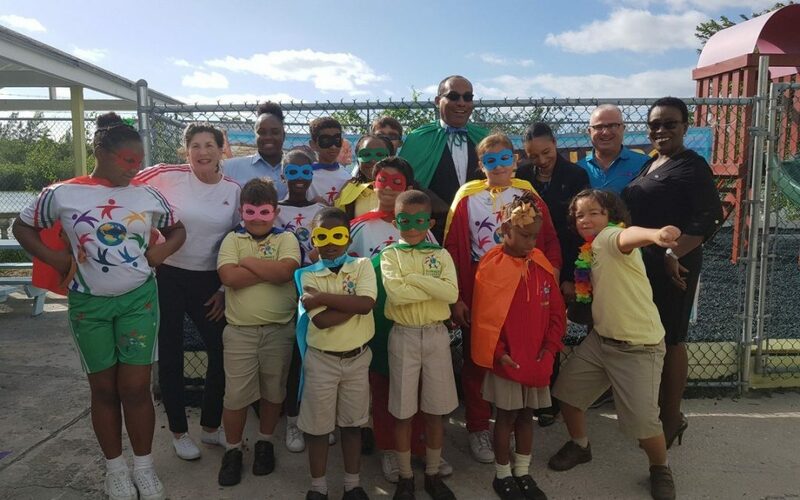 New Providence, Bahamas – New Providence is being invaded by a crew of caped crusaders; students on a mission to become ‘Neighborhood Heroes’, serving and protecting their environment at every turn! With the help of the Ministry of Environment & Housing and corporate Bahamas, thousands of students in public and private schools around the island have been working diligently on plans to make their neighborhoods, cleaner and greener through the Be A Hero Campaign. The initiative which encourages community cleanliness has received support from scores of the country’s national heroes. From sports icons like Shaune Miller-Uibo and Buddy Heild, to leaders in the business community like Nancy Kelly and Ed Fields, and even Bahamian music power couple Dyson and Wendi Knight, the message is the same – protecting and preserving the beauty of The Bahamas is everyone’s responsibility. The message is being delivered on television, radio, social media, in the newspaper and on billboards and bus bench signs that feature the heroes faces. This message is being taken from school to school, making sure students understand their role in the anti-littering, clean-it-up and green-it-up campaign and competition. As the country’s leading waste management company, creating cleaner communities is the ultimate goal for the team at Bahamas Waste Ltd. With decades of experience and a longstanding commitment to partnership and strong corporate citizenry, the company jumped at the opportunity to take part in the program as it makes its rounds among schools spreading the word and inviting others to join. “This program really fit well into the mission of Bahamas Waste which is to encourage proper waste disposal and create cleaner and safer communities,” explained Bahamas Waste Managing Director, Francisco de Cardenas. “As a company, we’ve tried to always support initiatives which improve the lives of residents in the communities we serve. Each year, we allocate a significant portion of our annual budget to doing just that, whether it be educational programs, sporting events and of course community cleanups”. As part of the initiative students, with the help of their parents and school teachers, will compete for a chance to receive national recognition for their project, a visit to the Governor General at Mount Fitzwilliam and a chance replace the national heroes on billboards. Franny, as he is known, recently joined Environment Minister Hon. Romauld Ferreira on a school visit at Summit Academy. The campus already has a strong connection to the program as one of the initiative’s model heroes is Sebastian Major, a 4th grader. With growing interest in the program, the Ministry of the Environment & Housing is anticipating fierce but friendly competition between participating schools. Interested schools are able to submit their ideas to the Ministry of the Environment – complete with before & after photos – via the campaign’s social media platforms which include Facebook atwww.facebook.com/beahero; Twitter, at the handle @Bahamasbe; Instagram, at the handle @BeAHeroBahamas and on Snapchat at @BeAHeroBahamas.